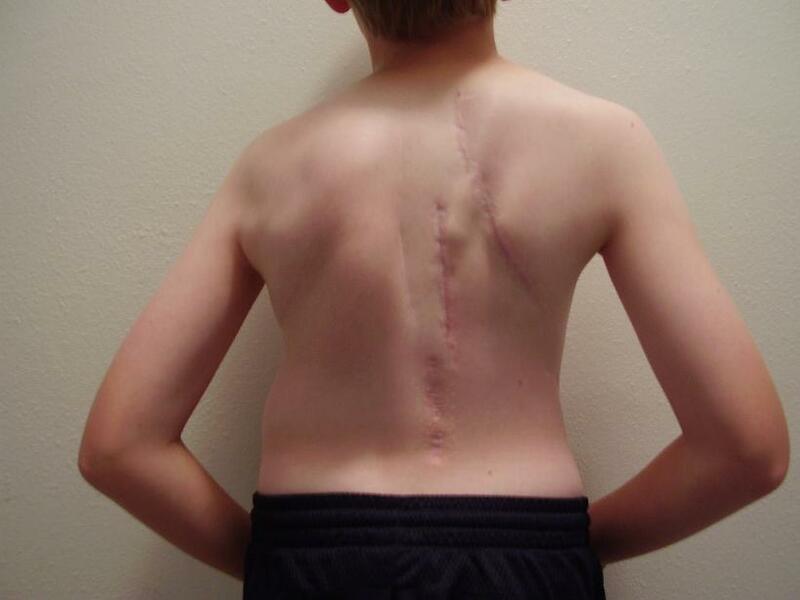 Braydon has severe congenital scoliosis - this page has photos and information about his scoliosis treatment. This page is dedicated to the strength and courage Braydon has had while living with congenital scoliosis. I hope the photos are not too graphic. My intention was to help parents of children (especially infants and very young children) realize the invasiveness of this procedure (A/P fusion) yet what strength and determination these children have to recover so quickly and so well. Braydon's official diagnosis is "multiple hemivertebrae with contralateral failure of segmentation" - the most aggressive combination of malformations one can have. Also, I hope to share our experience with various procedures to help inform parents who may not know about other surgical options for correcting/stalling progressive scoliosis. 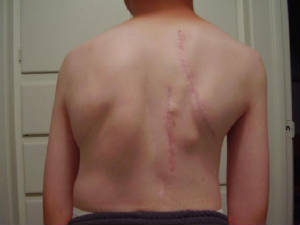 Braydon had anterior/posterior fusion only surgery on May 20, 1996. He is fused from T5-L1 on the convex side of the curve. 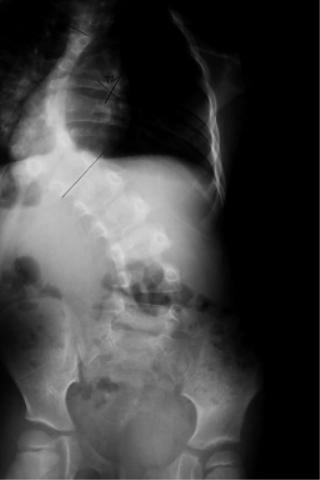 His congenital curve measured 75 degrees at the time of surgery. I wanted parents to see how incredibly well the incisions healed. Picture taken in Oct. 1998. This is a photo taken August 4, 2001. It is a little difficult to see, but you can see how his congenital curve appears to be progressing (because the scar is no longer straight) and his entire body is compressing or collapsing rather than growing taller, compared to the photo above taken almost 3 years ago. Braydon wore a TLSO brace for 5 months after his fusion surgery. This picture was taken at a cabin in Yellowston Park on July 23, 1996 - you would never know he was still recovering from major surgery. Braydon's spine xray at birth, measuring approx. 50 degrees. The image is reversed, but you can see how he had a single congenital curve at birth, then by age 3, he developed the lower compensatory curve (image below). Braydon's xray taken Oct. 2000. His lower compensatory curve is progressing, but the upper congenital curve is stable. 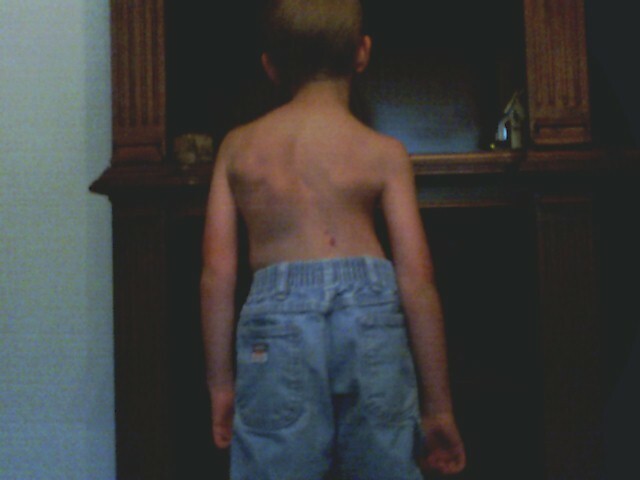 Braydon's back August 2007. You can see that the chestwall rod is no longer sticking out at the bottom! The "bursa" is gone because they re-attached the rod to the bottom ribs again. Makes it nice and smooth. The locking clip on the spine hybrid is getting more prominent, however. Very sensitive to the touch.